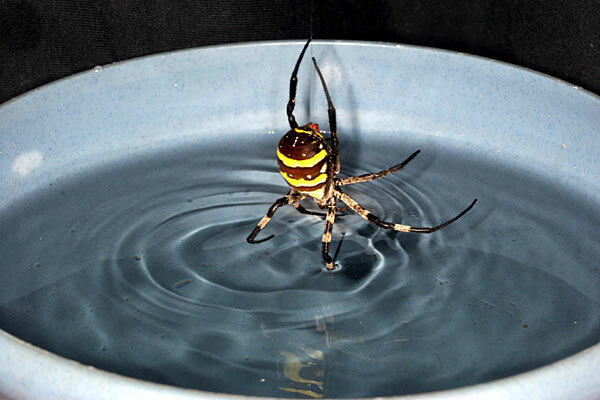 I observed how the orb web spider, Argiope amoena, avoided to drop to the surface of the water on Aug.7, 2005 in Nakamura, Kochi Prefecture, Japan. The Kumo Sumou, a spider-fighting match of an annual traditional event in Nakamura, was held on this day. Two spiders are placed on a stick where they battle each other. The spider with its own silk dragline, often dropped from the stick to the surface of water in a basin that placed about 60 centimeters under the stick. I observed on 32 drops. On one occasion, a spider was submerged in water. But on 31 occasions, when the spiders' legs touched the water, the spiders climbed up to the stick again. It occurred 97% of the time. It suggests that the orb web spider, Argiope amoena, notices the surface of the water by its legs, and avoids falling into the water. I am obliged to thank Dr. Makoto Yoshida for his long-term direction and reading manuscript of the present paper. 関根幹夫, 2005. コガネグモの水面への落下を避ける行動について. くものいと. 38:1-3.